Stories of life’s struggles and tragedies may not make for blockbuster hits or great “date” movies, but in some instances they make for critically acclaimed dramas, and in the case of a rare few, create unforgettable cinematic experiences or even masterpieces. The movie Precious, I feel, falls in the latter category. As I prepared to enter one of the early screenings of the film, packed with an audience of mostly my middle-aged, white male counterparts, I felt both excitement because of the buzz surrounding the movie, and in trepidation because this was after all, an urban drama being viewed by an elite group of mostly white critics. This was a situation rife with potential for exploitation- either on the part of the filmmaker, the reviewers, or both. As it turns out, there was little need for any concern because here was a “black” film that seemingly transcended its stereotypes and exclusivity of appeal, as confirmed by the audiences’ reaction during and after the screening. Based on the underground hit novel Push by Sapphire, Precious is the story set in the 80s Harlem of an obese black teen girl who endures overwhelming amounts of hardships. Not least of which include illiteracy, physical abuse and neglect from her mother, sexual abuse from her father that led to two pregnancies and children. Harlem-based director/producer Lee Daniels unflinchingly recounts the central characters multiple hardships with incredible rawness and delicacy. This is a challenge that can be difficult for the most experienced directors, with tendencies toward the over dramatic or exploitation, but Daniels strikes an impressive balance. At the same time he manages to breathe new life into a neglected and abused genre, while creating what could prove to be his masterpiece, or at the very least securing a long career, with fewer roadblocks to getting future projects off the ground. There are so many good elements to this project; it’s hard to say what stands out. The pacing manages to be brisk, but it never feels rushed; the performances are strong, but never overwhelming; the casting is surprising, but effective. For Precious Daniels didn’t even bother to seek out studio help at the onset because he knew a film with such themes wouldn’t “go over.” He did, however, go for key individuals with the financial wherewithal who were equally moved by the script and determined to make it happen (Lionsgate Productions came on board after completion). Daniels and cast supervisors Billy Hopkins and Jessica Kelly also took risks with the casting, creating an ensemble that on paper would cause many, myself included, to be skeptical, but in reality works incredibly well. Comedienne Mo’Nique pulls out a performance that is nothing short of stunning. As Precious’ abusive mother she’s scary, strong and believable, with a monologue that rivals Meryl Streep’s star turner monologue in Sophie’s Choice. With a significantly smaller, but also impressive role is Mariah Carey as a cynical, yet tender social worker, and Lenny Kravitz as a nurse who inspires and befriends Precious. 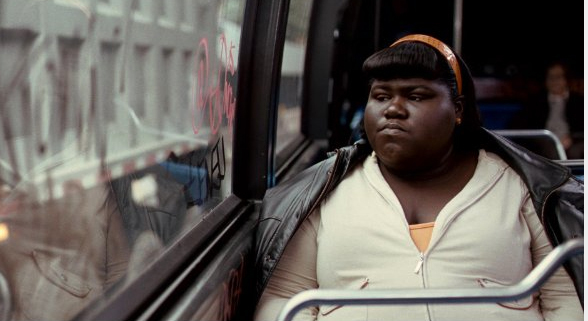 But the real head turner is newcomer Gabourey Sidibe in the title role, a non-actor find from Brooklyn. Her performance is completely understated and engaging, successfully capturing nuances of a truly troubled teen who struggles and dreams, while also creating a significant “other” character as the film’s narrator. On one hand the movie does unabashedly highlight certain social realities, with some feeling this will reinforce negative stereotypes within the African American community. On the other hand, there is something about the film’s execution and heart that allows the viewer to go beyond a specific sense of place and race. There are universal aspects to the heroine’s struggle and realistic small victories as Precious goes from illiterate to literate; invisible to pocessing a few great friends that care about her; peace with her past and freedom from a toxic home life. Make no doubt about it, this is a hard movie to watch and not necessarily for everyone. But while this is a hard movie to watch, it is movie worth watching.